For a more modern sword display, or a more militarized one, look no further than this Brass Bullet Expandable Sword Hanger. The design of this sword hanger makes it perfect for military sabers, as well as a variety of other weapons, including firearms. Straightforward in structure, each sword hanger in this set of two resembles a bullet with brass casing and a silvery gray tip. The settings that secure each hanger to the wall have a slightly ornate appearance. Spring-loaded for a secure hold and adjustable to suit swords, axes, rifles, and more, these wall mounted weapon hangers can transform your favorite weapon into a statement piece in your decor. Included with the hangers is appropriate hardware, which makes installing these sword hangers easy. They are made entirely from cast metal. 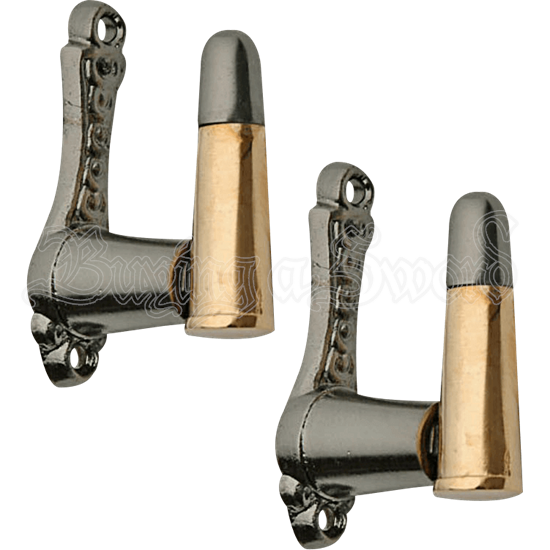 This Brass Bullet Adjustable Sword Hanger set is a particularly good way to display western rifles, civil war firearms, military swords from across the ages, and can of course be used to hold almost any other sort of weapon.